Posted Thursdays: Feb. 7, 14, 21, 28, Mar. 6, 13, 20, 27, Apr. 3, 10, 17, 24, May 1, 8, 15, 22, 29...and weekly until the migration is complete! Weather conditions caused sweltering heat but let massive numbers of monarchs move into MA, NH, VT, ME, ON and PQ: "Nous avons vu notre premier monarque aujourd'hui," came the news from Quebec City near latitude 47N. 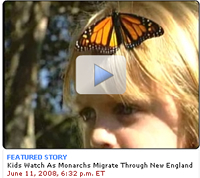 Students at Davis Elementary in Bedford, MA, saw their first monarch when CBS News Boston came to visit. Take a look! Brrrr....After another cold week in the north the migration still seems to be stalled at about latitude 45N in the central region and 42N in the east. 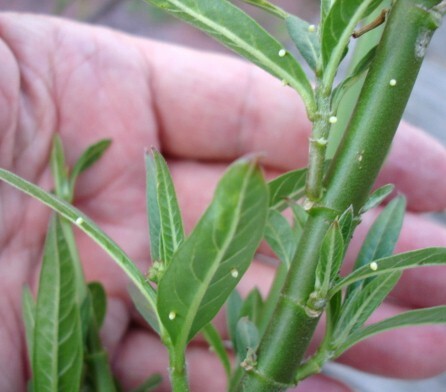 This week, watch a monarch hatch from its egg. What questions does this miraculous monarch raise? Send us your list! We'll try to answer them next week. They are few and far between, but monarchs have now reached latitude 45 north. Cool temperatures are slowing the migration northward. When the pattern breaks on Saturday south winds should bring warm air—and monarchs—northward. Let's see! This week, come on a photo safari and see if you can find the milkweed that's hiding in these pictures. The first monarch was spotted in Canada on May 8th this spring, the very same day as last year's first sighting. The big surge in numbers we have been predicting should occur any day. Let us know what you see! Meanwhile, explore the connections between milkweed and monarchs and enjoy a field trip to the milkweed patch in this week's slideshow. Monarch butterflies and ruby-throated hummingbirds both eat nectar and are both crossing eastern North America right now. Why do you suppose hummingbirds can travel north more quickly? Also look closely at two monarch larvae and compare them. Find out what causes the differences that you see. What a week! According to observers, the monarchs moved into six new states and a most remarkable sighting was reported from Sioux Falls, South Dakota. If the butterfly came from Mexico it would have flown over 1,600 miles! Do you think this is a reliable sighting? 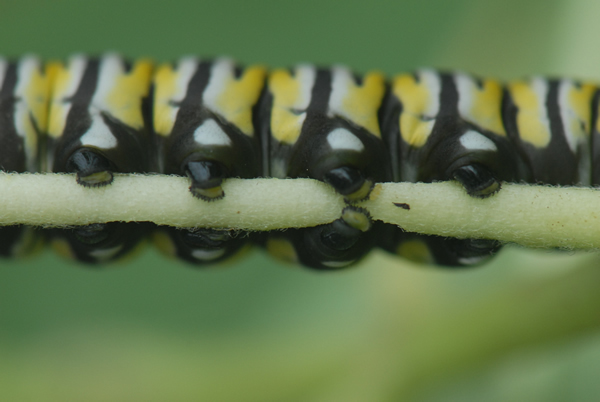 Also this week, take a close look at the amazing legs monarch larvae have. How do their special legs help monarchs survive? Last week's final blast of winter stopped the monarchs in their tracks. Look how little the migration map changed in the Central Plains, where most of the monarch population is poised to move northward. The big news this week is that new butterflies of the next generation are now being born in Texas! These young butterflies will join the migration and continue the journey north in place of their parents. March 27th was the week's big migration day. Scientists who monitor weather and insect migration watch for conditions like these.Take a look at wind and weather maps for the day. If you're waiting to see your first monarch? This week's migration map questions are for you! And don't miss Answers from the Expert, Monarch biologist Dr. Karen Oberhauser. It looked like fall migration along the Texas Gulf coast late last week there were so many monarchs! But the 'stop and start' nature of monarch migration is evident when you play this week's animated migration map. How closely do monarchs follow after milkweed becomes available in the spring? Dr. Brower explains why that's an important question. This week's photo is a monarch egg. Describe it! The first monarchs have arrived in Texas— and the first eggs of the next generation are being laid. Learn how to use our migration map in a scavenger hunt to answer questions. Also, predict where the migration move during the next month. Spring migration is underway! The monarchs are on their way! Dr. Bill Calvert reported last night from Angangueo after watching monarchs stream out of the Rosario colony in massive numbers. Then came the news from the state of Querétaro, 60 miles north. The journey north is underway! Also this week, alarming news about deforestation in the monarch region. Find out how students helped scientists collect the strongest evidence yet that the monarch forest in Mexico needs stronger protection. Two important signs of spring were noted during the past week at the over-wintering sites in Mexico. The monarchs are moving down the mountains, and mating is increasing. Last fall, classrooms sent over $11,000 to Mexico for monarch conservation. Two stories this week are about the work the students' donations are supporting. The goal of both projects is to take pressure off the forest by helping local people find new ways to live and work. The monarch's story is one of nature's greatest survival stories. Yet competition with people over use of the forest is the greatest challenge the monarchs face in Mexico. Today we'll explore uses of wood by families who live in the region. Meet children who live in the region and and see how their simple rural lifestyle compares to your own.